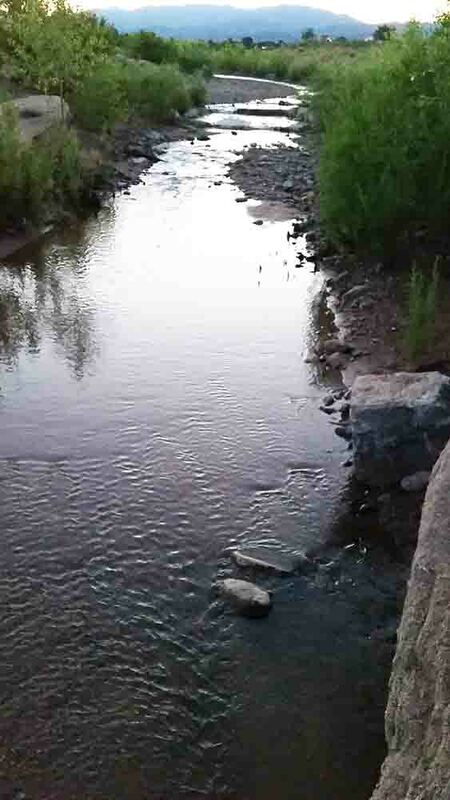 On a walk to the Santa Fe River we encounter the substance permeating our existence: water. The river is being opened up and repopulated with life; trails make it more accessible and it is increasingly safe in the public’s eye. In turn, we can open up to the land as our teacher. Earlier this spring I went on a walking tour with Rich Schrader beginning at the Frenchie’s Field footbridge. Seeing, hearing and experiencing the water above ground, in the banks, is the result of river restoration approaches and practices. Rich mentioned, “The City intentionally wanting the river to go deeper” to increase land for building development. Induced Meandering and Natural Channel Design implemented at this reach of the Santa Fe River are undoing the urban development methodologies that flushed water out of cities through straight, narrow concrete channels. Upriver from the footbridge, the Don Jose storm drain is now camouflaged, hardly noticeable, yet crucial to the order of the city. Painted with green blades and a yellow background, it’s shaded by young ponderosa pine, oak trees and others growing out of the settling basin. The drain “used to have a ten foot deep gully coming out of the culvert,” according to Rich. He designed the restoration alongside Watershed Artisans who implemented the project. They created a collection basin by arranging boulders in a media-luna (half-moon) formation with french drains hidden beneath the smaller rocks and topsoil. This helps distribute and spread the water out. The rocks build sediment and slow water enough to settle into the soil, so the land can swell like a sponge. While we may see the water itself, there is unseen infrastructure at work. What we do see are plants making use of the water and thriving. This is a result of work which considers the riverbed as a sponge, instead of a concrete culvert. Plants are our allies who stabilize soil to prevent erosion. With our eyes we can observe how well the riparian area is functioning. Yet we magnify our capability to perceive with our other senses. Nourished plants tell their story through their texture and the sound of the wind rustling leaves in the summer. To know they are alive, “feel branches for supple, coolness.” Rich instructs me to use the sense of touch as he reached out to feel the saplings. By using our senses to open up to the land along the Santa Fe River as our teacher, we relate to our surroundings. Through participating in the observation of our surroundings, we learn the lived experience of water. Art is a tool to observe the embodied, multisensory experience because of the diversity of mediums. Smartphones can be used for audio recording or even strategic photo monitoring. Pencil and paper can also draw us in to notice the systems we typically overlook. Experiential education, research and art programs are also key to transform patterns of consumption as dictated by infrastructure. Rich directed me to a small ravine freshly lined with grapefruit-sized rocks. Community members did the work in a short amount of time with their own hands. Like the Don Jose catchment basin, the rocks are now slowing the water down, stabilizing soil, and rebuilding the sediment for vegetation which creates habitat. Instead of trickling away, the earthwork plants the water. Collaboratively, they sculpted a smaller-scale water catchment, an excellent example of project-based community engagement. They tended to the land in a way that is based on paying attention to its’ nature. This site-specific installation exemplifies practical biomimicry as an alternative to the ecologically destructive infrastructure we know. Along this stretch of river, there is already an outlet for your creative contributions- The Dreaming Water House at the bridge near Frenchy’s Field. The folks from the Commons created art and poetry about the Santa Fe River for their house. It is meant to, “encourage citizens and visitors to gather at the river and reflect on the value of water and the reality of the river in our lives,” according to the project’s creators. You can deposit your own creation or notes from conversations with the river during your own walks in the “sign-post” style cache box. Or you may even be inspired to construct one in a waterway near you. We can use sites like these as places to learn what Anita McKeown calls a “processual resilient practice” in the way we use and relate to water. McKeown fosters arts-led opportunities for sharing intimate narratives of place, utilizing Creative Placemaking (CP) for cultural regeneration and the making of resilient places. To use “Arts and Culture to support equitable citizen-led practices of CP,” we can move away from CP being used for inequitable strategies of branding, marketing and shaping the built environment like waterfront redevelopments and similar gentrification processes (McKeown). If you’re in Santa Fe, visit the Dreaming Water House. What do you think is missing? Is there something you can include to reflect what’s not represented? Would it be a clip of sound, a hand-drawn map, photographs of plant species along your path, a series of selfies reflecting how you use the waterway, a digital or hand-drawn cartoon inspired by your visit to the river, or audio clips recorded in voice memo app in your smartphone? What do you hear? What don’t you hear? What do you smell? Consider the history of the place and how interactions between water and people have shaped and reshaped the place. Consider what history we know of the place where we walk. In this case, the Native Americans and the Spanish who previously called Frenchie’s Field Cienguita. In A Different Kind of Ethnography, Elliot and Culhane suggest to note “What difference does your own history, and/or your families’ histories, make to your present experience and to your imagined futures in relation to this place? How is this experienced through your senses?” (Culhane 60). Now, go to a concrete lined culvert or drainage ditch and answer the same questions. What are the different sensations that arise? Notice the differences of sedimentation around rocks held together with concrete versus without. What are the differences in vegetation? Are there other people nearby? What are they doing? Are there clues that other people have been there? How will the final product of your project be seen or experienced; online or on the banks of the river? Who will see it; students from a class you’re taking or by passerby’s? Center for Imaginative Ethnography Website A Different Kind of Ethnography: Imaginative Practices and Creative Methodologies by Denielle Elliott and Dara Culhane. layering to communicate knowledge at varying levels of detail. Anita McKeown practices and advocates for cultivating permaCultural Resistance. She encourages everyone to participate to: “Re-situate Arts and Cultural practices to lead the building of cross-sector micro-ecologies that develop strategic intervention tactics to re-seed local knowledge, specialist and non-specialist, to creatively make and re-make dynamic resilient places.” At the core of her Art Services Unincorporated’s (ASU) approach is the recognition of locals as the eco-socio cultural experts who present resilient behavior. “Central to understanding ‘localised problems,’” according to McKeown, is the local residents’ knowledge and resiliency. Elise Sibley Chandler is an artist and anthropologist living in Marfa, Texas. Just as water transcends boundaries, she transcends disciplinary boundaries. She examines out-of-sight infrastructure like waterways and how their design influence behavior, attitudes and resource consumption. Her multi-sensory, site-specific installations, videos and performances are based on ethnographic research. Elise developed an initiative which encourages a holistic reconceptualization of the interconnectedness of the Rio Grande Basin. Emplaced and arts-based participatory programs are a primary component to leverage local knowledge for decentralized water management. She is now deepening her relationship with Chihuahuan Desert plants by uniting cultivators, harvesters and processors for local resource production and supply to improve the health of our watershed. Elise received baccalaureate degrees in both Studio Art and Anthropology with a certificate in Native American and Indigenous Studies from UT Austin in 2013. Her work has been featured in Austin and Marfa, Texas, Aspen, Colorado, and in Santa Fe, New Mexico. To collaborate or for more details about micro-ethnography student exercises she has conducted, send an email to candelara@elisesibleychandler.com. To see a sample of her artwork visit Elise Sibley Chandler.